At Lasher Sport we strive to produce attractive high quality custom wheelchairs and sports equipment. We build our wheelchairs one at a time to the exact measurements and exacting demands of our customers. Your happiness is our ultimate goal. We don't stock pre-made frames which fit generic sizes that can be ‘adjusted’ to fit many users. We fabricate your chair for you the old fashioned way, one at a time. Each chair we manufacture is custom built to the closest tolerances when we receive your order. All components are precision CNC machined out of 6061 and 7075 aluminum alloys commonly used in the aircraft and aerospace industries. Our complex backrest brackets are custom machined using the latest CNC water abrasive cutting system. This machine actually cuts the parts using highly pressurized water that cuts the 7075 aluminum with a jet of water traveling at super-sonic speeds without heat affecting the piece. 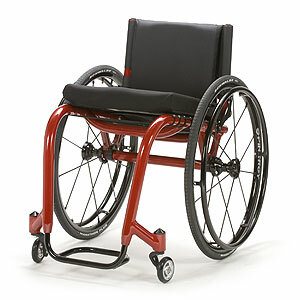 We call our wheelchairs premium wheelchairs because they come equipped with standard equipment like Frog Legs shock absorbing caster forks with aluminum billet caster wheels for a smoother ride, Spinergy wheels which are incredibly strong and ultra-light, and tension adjustable seating so you can fine tune your seat and backrest. These options are for the user who wants their chair to be a real head-turner. Our glance billet aluminum wheels and custom anodized finishes add the ‘wow’ factor to your ride! Our welder has over 25 years of aircraft welding experience and enthusiastically brings his talents to the Lasher Sport family as he builds your chair for you. For more information about Lasher Sport, please visit our Frequently Asked Questions page.